Synapse: The point at which neurons gently touch each other to send or receive a nerve impulse or message. 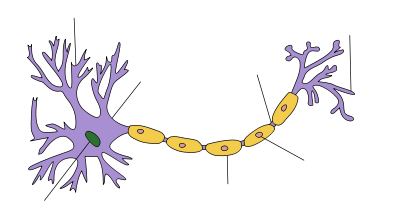 Motor neurons or nerves: The neurons that send and transmit message that involve muscle movement. Afferent nerves: Nerves that send and receive sensory function related nerve signals. Olfactory nerve: The sensory cranial nerve that transmits the sense of smell or odor. Optic nerve: The sensory cranial nerve that transmits the sense of vision or sight. Trochlear nerve: This motor cranial nerve also controls some eye movements. Abducens nerve: This primarily motor cranial nerve controls eye abduction. Facial nerve: This combination motor and sensory cranial nerve controls facial expressions, the tongue and the salivary glands. Glossopharyngeal nerve: This combination motor and sensory cranial nerve controls gustatory or taste impulses and the secretion of saliva from the parotid gland. Vagus nerve: This combination motor and sensory cranial nerve controls parts of the respiratory and the digestive systems such as the pharynx and swallowing. Spinal accessory nerve: This motor cranial nerve controls the movement of the trapezius and sternocleidomastoid muscles of the shoulder. Hypoglossal nerve: This motor cranial nerve speech and swallowing. The nervous system, sometimes referred to as the neurological system, is perhaps the most complex of all the bodily systems. Briefly stated, the nervous system coordinates controls and enables the vast majority of bodily function, including movement, thinking, autonomic, or automatic, things like pupil reflexes and sensory perception. The nervous system sends messages to all parts of the body and it also receives messages from all parts of the body. For example, when a person touches a source of heat, the message of heat is sent to the brain. The brain then interprets and processes this message of heat as pain. The brain then sends a message to the person's finger to remove the finger from the source of the heat because it is the source of pain which is an unpleasant sensation. The nervous system is comprised of an intricate system of millions of nervous system cells which are called neurons and glia cells. The neuron is the primary type of cell in the nervous system. They are, in fact, often referred to as a nerve cell. Glial cells, on the other hand, are a type of nervous system cell, other than a neuron, that forms myelin which is the covering or sheath over parts of the neuron rather than motor and sensory functioning. Neurons send messages to and communicate with other neurons in the nervous system with their synapses. A synapse is the point at which neurons gently touch each other to send or receive a nerve impulse or message. There are two basic types of neurons which are sensory neurons and motor neurons. Sensory neurons "sense" and transmit information from the external environment such as taste, touch and sight. Motor neurons, on the other hand, send and transmit messages that involve muscle movement. For example, in the scenario above about the person that touched a source of heat, the message of heat that was sent to the brain was sent with sensory neurons and the message that the brain sent to move the hand was sent with motor neurons. In contrast to neurons, glial cells have a relatively small role in the nervous system; glial cells do, however, form myelin which is the covering or sheath over parts of the neuron cells. The nervous, or neurological system, consists of two major parts with each part serving the body with different roles and purposes. Anatomically, the brain is housed in the skull or cranium at the top of the body. The brain consists of three major parts or sections. The brain is described as having two hemispheres which are the right hemisphere on the right side of the brain and the left hemisphere on the left side of the brain. 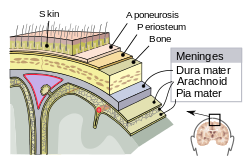 The brain, like the spinal cord which is discussed below, is not only protected with a boney protective structure, but these parts of the central nervous system are also covered with a protective membrane which is called the meninges, as shown in the picture above. The spinal cord, like the brain, as stated above, is covered with meninges. Between the arachnoid layer of the meninges and the pia mater of the meninges is the space referred to as the subarachnoid space. It is this space that holds and envelopes a continuous and uninterrupted encasement of cerebrospinal fluid. The brain and the spinal cord are both comprised of gray, or grey, matter and white matter. Gray matter plays a higher role in the central nervous system's functioning when compared and contrasted to the white matter of the brain and the spinal cord. The gray matter is comprised of myelinated neurons, unmyelinated neurons, glial cells, and circulatory capillaries. In contrast, the white matter of the brain and the spinal cord consists of far fewer cells than the gray matter. The cerebrum, as shown in the picture above, is the largest part of the brain; the cerebrum and its lobes coordinate and enable bodily movement, sensory perception, learning, the sense of smell, which is referred to as the olfactory sense, the sense of taste which is referred to as the gustatory sense, the vision sense which is referred to as the optic sense, hearing which is referred to as the auditory sense, memory, thinking, judgement and language and communication abilities. Each of these four lobes has a different role and function in terms of the overall nervous system's functioning. 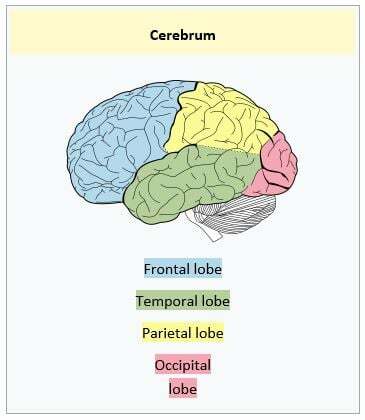 The cerebellum, as shown in the picture below, is also referred to as the "little brain" because it is much smaller than the cerebrum and is also referred to as the "hind brain" because the cerebellum lies in the back of the skull posterior to and behind the other parts of the brain. The cerebellum controls and manages bodily movement in terms of motor control, balance, equilibrium, fine motor coordination and gross motor coordination, as well as a lesser role in terms of speech and attention span. The brain stem lies at the base of the skull between the right and left hemispheres of the brain, as shown in the picture below. Medulla oblongata purple, part of the brain stem colored. The midbrain controls messages sent from other higher areas of the brain to the pons and medulla below it and it also controls posture because the posture reflex is located in the midbrain. 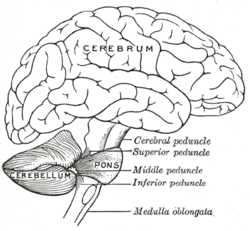 The pons, in the center of the brain stem, as shown in the picture above, connects to the midbrain above and the medulla below. The pons controls the rhythm of respirations. The medulla, or medulla oblongata, the lowest section of the brainstem and the brain itself, connects to the pons above and the spinal cord below through a hole in the base of the skull called the foramen magnum which is an opening in the occipital bone of the skull; the spinal cord is also a part of the central nervous system. 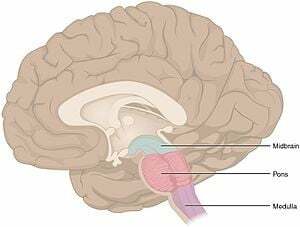 The medulla is the center of control for many of the most basic of vital signs and vital functions such as breathing and cardiac functioning. It also manages the swallowing, vomiting, cough, and sneeze reflexes. 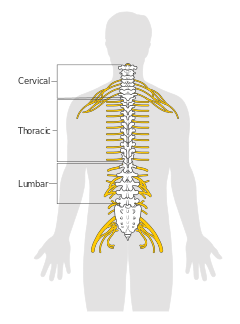 The spinal cord is the nervous system tissue that connects the brain at the base of the skull to the many and immeasurable peripheral nervous system's nerve cells throughout the body, as shown in the diagram below. The spinal cord extends from the base of the skull to the lower part of the body, which is referred to as the lumbar region. Diagram of the spinal cord showing segments. The spinal cord has a total of 31 clusters of nerves from the beginning of the spinal cord to the lowest section. The spinal cord transmits and receives messages to and from the rest of the body. Simply stated, the spinal cord sends and receives motor and sensory messages and it also coordinates and enables the abilities of many reflexes to perform their roles. 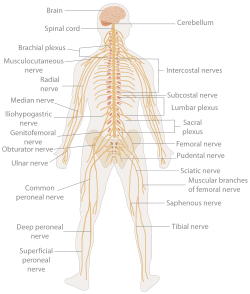 Simply said, the peripheral nervous system consists of all the parts of the nervous system other than the brain and the spinal cord which are the two parts of the central nervous system. The peripheral nervous system, unlike the central nervous system which is protected with the boney structures of the skull and the spinal column, the peripheral nervous system is not protected with these boney structures. The autonomic nervous system controls automatic and involuntary physiological functions of the body that are outside of our control. Some of the physiological functions under the control of the autonomic, or automatic, nervous system are the movements of smooth, involuntary muscles, in contrast to the movement of voluntary skeletal muscles. Examples of autonomic nervous system function include things like the peristalsis in the digestive system that moves digestive contents along the gastrointestinal tract, the involuntary constriction of the eye's pupil when it is exposed to light and the activities of glands such as the pancreas and other endocrine glands, which will be described and discussed below with the Endocrine System. Sympathetic nervous system responses prepare the body for the "fight and flight" syndrome that result from stress. These responses include an increased heart rate, pupil dilation and decreased peristalsis. The parasympathetic nervous system, on the other hand, manages the other bodily functions that are NOT related to "fight and flight" and, instead, related to rest. For example, the parasympathetic nervous system manages involuntary control of tears, digestion and the production of saliva.. 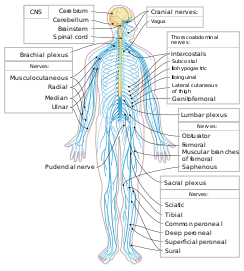 The somatic nervous system, in sharp contrast to the autonomic nervous system, controls voluntary physiological bodily functions such as voluntary muscular movement with the skeletal muscles of the body. The somatic nervous system has efferent nerves which send and receive motor function related nerve signals and also afferent nerves which send and receive sensory function related nerve signals. A reflex is a muscle reaction that automatically occurs in response to a certain type of stimulus, or stimulation. There are two types of reflexes. Some reflexes are present at the time of birth but they disappear shortly thereafter; and other reflexes are present at the time of birth and they remain active throughout the person's entire life. Olfactory: This sensory nerve transmits the sense of smell or odor. Optic: This sensory nerve transmits the sense of vision or sight. Oculomotor: This motor nerve manages many eye movements. Trochlear: This motor nerve also controls some eye movements. Abducens: This primarily motor nerve controls eye abduction. Facial: This combination motor and sensory nerve controls facial expressions, the tongue and the salivary glands. Glossopharyngeal: This combination motor and sensory nerve controls gustatory or taste impulses and the secretion of saliva from the parotid gland. Vagus: This combination motor and sensory nerve controls parts of the respiratory and the digestive systems such as the pharynx and swallowing. Spinal accessory: This motor nerve controls the movement of the trapezius and sternocleidomastoid muscles of the shoulder. Hypoglossal: This motor nerve controls speech and swallowing.